Old-Timey, hootin', hollerin', foot-stompin', shake-what-your-mama-gave-you progressive bluegrass featuring fiddle, acoustic guitar, clawhammer banjo, upright bass, drums, and a 1962 American Tourister suitcase. 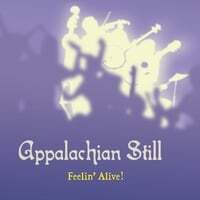 After a busy summer of gigs in 2010, Appalachian Still went into SpiritHouse Studio for a couple of marathon sessions to lay down some tracks that the band had honed through countless live shows. Feelin' Alive! is the sum of these sessions. Drawing from a repertoire that includes traditional fiddle tunes, classic bluegrass, original songs, and a taste of classic rock and rockabilly, the album represents the broad musical backgrounds and interestes of the group. Though it might be easiest to call Appalachian Still a bluegrass band, this ain't your daddy's bluegrass.